The three-stage treatment composed of Microfiltration (MF), which removes suspended solids and pathogens such as bacteria and protozoa; followed by Reverse Osmosis (RO) that removes dissolved salts and submicronic constituents such as viruses; and finally, Ultraviolet/Advanced Oxidation (UV/AOP), which degrades any residual organic contaminants. To help alleviate water shortages, treated wastewater can be turned into high quality fresh water using cutting-edge technology with tight controls on the treatment process. To demonstrate its feasibility, a number of bodies in California initiated an indirect potable reuse project. In a world facing rapid climate changes and growth in potable water demand, new sustainable water sources must be developed in order to maintain a healthy environment. One of the most readily available sources of fresh water is treated wastewater that can be further treated to a very high quality and could reach a quality superior to natural tap water. The reused water can be used to recharge depleting aquifers or lakes, to supply water to the industrial sector, or even for direct use in the potable conveyance system. The key to reaching this level of high-quality water is the implementation of cutting-edge treatment technology with tight control on the treatment process. 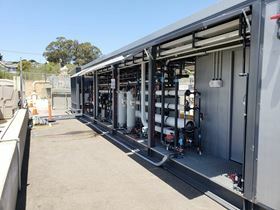 In an effort to demonstrate the feasibility of a treatment process of this kind, the City of Pismo Beach and the South San Luis Obispo County Sanitation District, together with member agencies, the Cities of Grover Beach, Arroyo Grande and the Oceano Community Services District (OCSD), in California have initiated the Central Coast Blue Advanced Water Purification Facility, an indirect potable reuse project. The goal of this project is to prove the reliability of the process and the feasibility of turning wastewater into high-quality fresh water that will be recharged into the groundwater basin. The five-cities communities of Central Coast Blue have collaborated with IDE Technologies, which is providing the technology for this facility. This includes a three-stage treatment (see image right). The first phase of the demonstration implements IDE’s Eco-Reuse process. This process offers several advantages over the standard reuse process which is termed FAT- Fully Advanced Treatment. Normally chloramine is dosed to the feed water to control the formation of biofouling on the membranes. However, Chloramine poses a health risk because it is a precursor to the formation of Nitrosodimethylamine (NDMA), which is an organic contaminant and suspected human carcinogen. In addition, it increases the risk of membrane oxidation, shortens the life expectancy of the membranes and adds cost to the process. In the Eco-Reuse process no Chloramine is used. Instead, RO membranes are kept clean by the preventive maintenance approach, whereby periodic cleaning of the membranes takes place using a proprietary process termed Direct Osmosis High Salinity (DOHS). This process includes a short injection of concentrated saline solution that reverses the flow direction of the RO membrane, thus backwashing the membrane surface. Further, exposure to the high-saline concentration inactivates bacteria, which further reduces the biofouling potential. The ability to operate the system without chloramine dosage also makes this a more environmentally-friendly process. Another tool to keep the membranes clean is periodic flushing of the membranes with permeate water, which prevents scaling formation. Both these processes maintain clean membranes, thus save energy, and allow longer membrane life expectancy and less frequent chemical cleanings (CIP) of the membranes. The last element of the treatment process is UV/AOP, in which high UV irradiation and injection of an oxidant initiates the formation of short-living free radicals that rapidly attack and degrade organic contaminants. The efficiency of this process is dependent on the transparency of the water (UVT value). Chloramine reduces the UVT value, thereby increasing the energy demand of the facility and requires a higher-power facility. Avoiding the use of Chloramine therefore reduces the OPEX and CAPEX demand by 30-40%. The second phase of the demonstration will be the conventional Fully Advanced Treatment (FAT) process, which will serve as a reference for the Eco-Reuse process. Each phase will run for three months, with RO recovery of 75-80%. The specific flux stabilized at about 0.12-0.13 gfd/psi in the first stage and 0.09-0.1 gfd/psi in the second stage. The specific flux of the first stage is about 25% higher than a parallel reuse facility in Orange County (which is 0.09-0.1gfd/psi). It was worth noting, that the initial decrease in specific flux is normal and is attributed to membrane compaction. The differential pressure is an indication of the fouling and scaling on the membranes. During the first 80 days there was a moderate increase of about 10%, indicating that the preventive maintenance is effective. The dP in Orange County is 50% higher in the first stage and about 10% lower in the second stage. 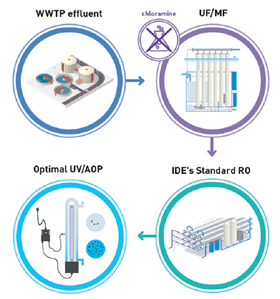 As no chloramine was dosed, the UVT reached 100%, thus allowing savings on the UV/AOP system OPEX and CAPEX of 30-40% in a full scale installation. Both the MF and RO membranes were tested for their integrity. The membranes maintained their integrity throughout the demonstration time. The RO showed better than expected results, rejecting 94% of the nitrate and 99.9% of organic contaminants. MF performance: The MF performance remained stable throughout the demonstration time, with flux of 33 gfd and specific flux of 4-5 gfd/psi. Chemical maintenance cleanings used only hypochlorite (every 48 h). The abundance of treated wastewater on one hand, and the urgent need for fresh water on the other hand, calls for a wiser usage of this valuable source. Recent progress in this field enables a better, safer and more environmentally friendly process. A recently-opened demonstration facility yields good results and increases confidence in this process. In addition, the facility serves as a public outreach facility, allowing stakeholders, elected officials and citizens to learn, and even taste the product water, as was recently done during the ribbon cutting ceremony. This is yet another step toward a more sustainable and resilient water management market. Early pilots have shown increased brine recovery of up to 98%. Dow Water Academy will be hosting a free webcast Wednesday, August 26th at 1:00pm (CT).